South Africa is the proud leader of the first official 1km ice swim event held in Antarctica waters! On 25 November, 00:15 South Africa time, the gruelling wait was over. Ram Barkai of South Africa successfully led 14 ice swimmers from across the globe to complete the first official 1km ice-swim at the bottom of the earth. While others pack their thickest jackets to visit the South Pole, these ice-swimmers appeared in Speedo’s on rubber ducks alongside the OneOcean expedition cruiser, RCSG, to swim in -1.4 Deg C waters. Support staff and South African Emergency Physician expert, Dr Sean Gottschalk, were ready to perform rescue operations if needed but swimmers were mentally and medically fit to withstand the extreme conditions. Waiting upon a weather gap that would allow the swim was of the hardest challenges they experienced. The weather changed constantly and interrupted the event, which really tested swimmers’ psychological endurance. 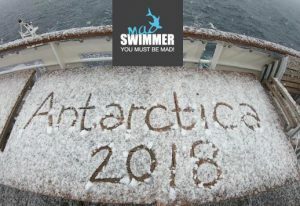 A test swim was done on 22 November after which expedition leader Ram settled on a location, Port Lockroy, a natural harbour in front of the Antarctic Peninsula, to do the official swim. The strategy involved heats of 3 or 4 swimmers per heat who were accompanied by support and rescue staff in rubber ducks. After the first 2 successful heats comprising 7 swimmers, currents and wind started to create havoc and boat management had to pull up anchor to sail to the next possible swimming location, Mikkelson Bay, trusting weather will allow the remaining 7 swimmers to complete the swim. At Mikkelson Bay they were left with a very narrow weather window and decided to combine heat 3 and 4 – their only chance to get all swimmers through. The very last swimmer to enter the water was expedition leader Ram Barkai who again had to wait a gruelling while for a weather gap before he could successfully complete the swim. Recovery involved the quick accessing of the expedition ship’s sauna and jacuzzi area under the close supervision of Dr Gottschalk. Some swimmers’ core body temperature was measuring only 28 deg C in the recovery room after the swim. Extensive travelling, 2 days in flight and 2 more on sea, to reach their destination and swim was no small feat. Crossing Drake Lake was a challenge in itself with waves 10m and higher and cutlery flying around in the dining room of the ship. “There are concerns that ice swimming is way too dangerous for the average person but the individuals who are getting into ice swimming are anything but average”, observed Steven Munatones of World Open Water Swimming Association. “From what I have seen the organizers and ice swimmers are as knowledgeable and experienced in the cold as they are responsible and safety-conscious. This sport attracts truly driven and unique individuals who are well-prepared physiologically and psychologically to handle swims up to 1000 meters – and longer – in the cold air and water conditions under 5°C. After a decade of ice swimming Barkai and his ice swimming colleagues around the world have learned a significant amount of how much the human body can acclimate to cold water and how best to implement the rewarming process. ” http://dailynews.openwaterswimming.com/2018/11/rethinking-whatis-possible-in-ice.html. Others have swum in Antarctica waters before but it has never been an official event. Barkai, who has worked almost 2 years to put this major event together, applied International Ice Swimming Association (IISA) rules to make it official and will also apply for a Guinness World Record now that it is done. Swimmer Jean Craven who represents the non-profit organisation Madswimmer decided to up his fundraising target from R50 000 to R500 000 for children’s charities. “Getting here was no small feat. Raising only a few rands will not justify the effort. We hope the swim will inspire others to do their part to make this world a better place and give under privileged children a chance to become the worthy citizens they deserve to be”. To view the charities and donate, visit www.madswimmer.com. Madswimmer has raised over R9-m over the years to support children. South African swimmers included Ram Barkai (founder IISA), Jean Craven (founder Madswimmer), Samantha Whelpton and Clinton Le Sueur. Others were from Poland, Russia, Australia, Argentina, Italy, China, Bulgaria and Spain.